Dec. 18, 2013 6:00 a.m. The New Sweden Mission Church, a thriving rural church a few miles south-east of Wetaskiwin, continues its custom of putting on a traditional Christmas concert. 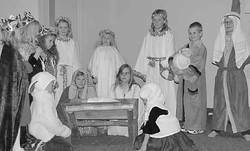 This year the program centred around the play “A Charlie Brown Christmas” put on by the older classes in the Sunday School, with the rest of the 38 children in their Sunday School involved in one or more of the choruses singing traditional Christmas songs and in the Nativity Scene. Particularly cute were the youngest group of children, all boys, who were dressed as gingerbread cookies, so popped out of an oven to sing their song. It was a shorter, simpler program than many they have presented, but, as always, the true message of Christmas came through loud and clear, and it was most enjoyable. Of course, the refreshments and visiting afterwards were most enjoyable.